@dylanmc Could you give some detail as to what arguments you gave to minicom for connecting and what settings you set in the Inkscape gcode plugin? the default baud rate (115200) and serial settings (8N1) work fine. The /dev/tty.wchusbserial### can change based on whether another USB serial device is attached, so I just type /dev/tty.w<tab> and the terminal autocompletes. @dylanmc Are you using a modified Inkscape g-code generator or the standard one? I am using the standard one. I'm now 100% up and running on MacOS only, with no need to run EleksCAM. The Inkscape plugin is generating g-code just fine, and I use the "minicom" terminal program to send the g-code to the Eleksdraw. 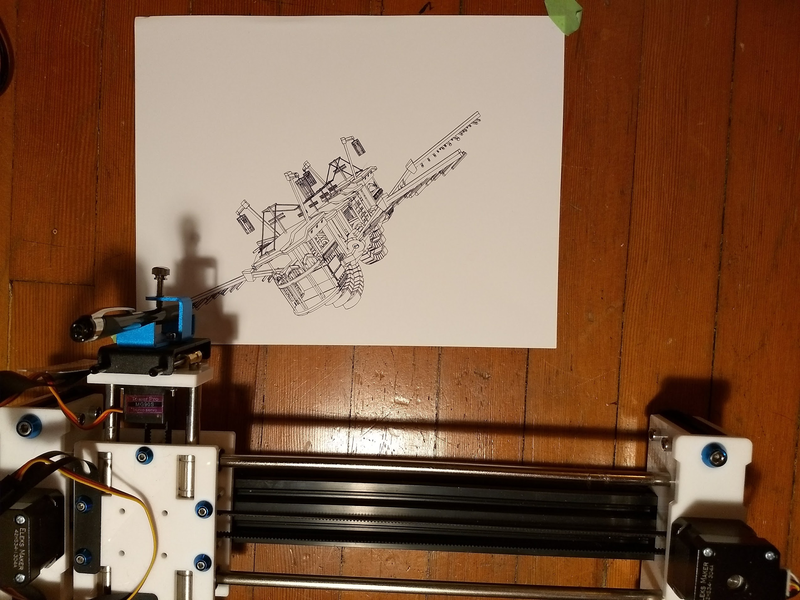 I've attached a drawing we just made - my son modeled the gondola in Blender, then used Blender's "Freestyle" rendering option to generate an SVG, which we then opened in Inkscape, and used the Eleksmaker SVG generator to produce the g-code, and then minicom to transfer to the Eleksdraw. Looks fantastic! I can't tell, but from your photo it looks like your whole pen assembly is too close to the drawing surface. I just measured mine, and from the bottom of the white kind of T-shaped piece to the drawing surface is about 36mm. @Zax I successfully flashed the EleksROM.hex to a new Nano (my ICSP programmer is at work). I was surprised that by default it doesn't use CoreXY mode, and I had to use EleksCAM to set it to that mode, as well as the Servo mode. I'm sure there are $ grbl commands to do that, but didn't know what they were. Happy that it's 100% working again, but still interested in being able to build my own grbl1.1 version. It seems that the EleksMaker fork of grbl should be out there, which would help folks like us merge their cool changes into the current grbl version. My build of the grbl-servo 1.1 fork installs fine, but doesn't respond to any serial commands - I can't really tell what's gone wrong yet. @Zax - thanks for the info -- you're a superb help to the community. Oh, and Happy New Year! I probably should have waited for @Zax's reply, but I tried to flash a freshly built grbl1.1. avrdude started out fine, then reported a ton of messages. Now I think I need to reflash the bootloader, because when I try to flash even just a tiny program, avrdude complains "programmer not responding". I've got an ICSP programmer - is there a way to start from scratch that way? Alternatively, I have a few Arduino Nano clones - could I plug one in in place of the Eleksdraw's nano? Finally, I realized I configured the gerbl software for CoreXY, but didn't see any options for configuring Servo support - how does one do that? Thanks! @nebiaydogdu I'm also interested in updating my Eleksdraw to GRBL 1.1. I'm pretty handy with Arduino - is it just a matter of downloading the grbl code, configuring it for CoreXY, creating a .hex and flashing it, or is there more to it? It sounds to me like your motor control might not be powered up? There's a separate power switch for it. Make sure you're in "mm" mode - this code only runs in that mode. If you're in inches, pt, or cm mode, it won't work.